Our Sun provides the light and heat that energizes our plants, our solar panels and our weather, among other things. Our Sun provides the light and heat that energizes our plants, our solar panels and our weather, among other things. But its influence stretches over the horizon into our nights, as well. As our nearest star, the Sun bathes Earth in a steady stream of energetic particles, magnetic fields and radiation that can stimulate our atmosphere and light up the night sky, like the aurora borealis, or northern lights. 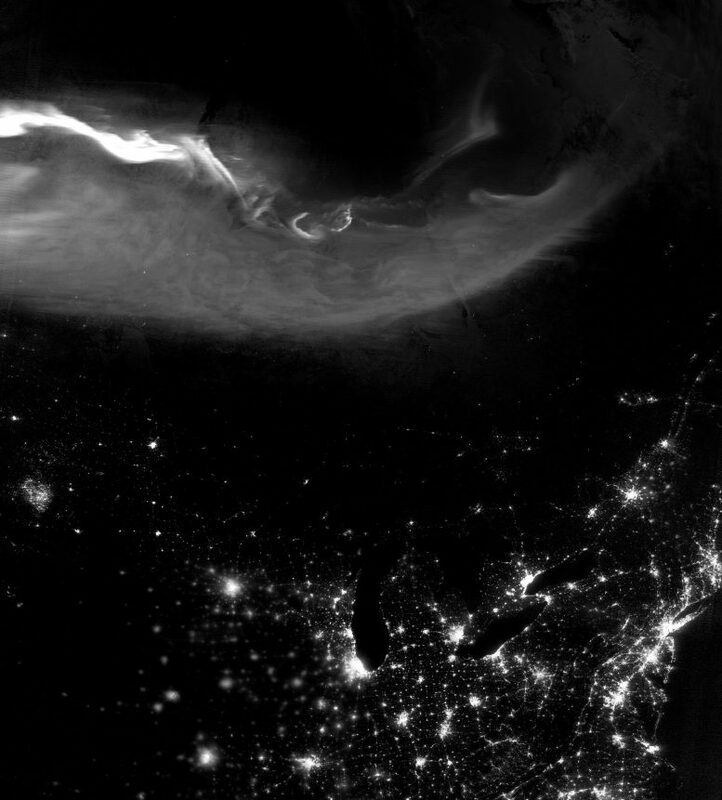 At 3:46 a.m. Eastern Time on April 21, 2018, the Visible Infrared Imaging Radiometer Suite (VIIRS) on the Suomi NPP satellite acquired this image of the aurora borealis over North America. The nighttime image was made possible through VIIRS “day-night band,” which detects light in a range of wavelengths from green to near-infrared and uses filtering techniques to observe signals such as airglow, auroras, wildfires, city lights, and reflected moonlight. Scientists recently discovered a new type of atmospheric light emission related to auroras and known as strong thermal emission velocity enhancements or STEVE. STEVE is a thin purple ribbon of light that can appear in the presence of an aurora, although it was not reported during the April 21 event. You can participate in a citizen-science project to track auroras and help find new observations of STEVE through Aurorasaurus.